Cauliflower with Fresh Parmesan, Thyme for Cooking side dish. 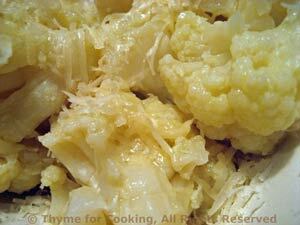 Cut cauliflower into pieces, put into a steamer and steam over water for 12 - 15 minutes until fork-tender. Remove and empty water from pan. Heat oil in the same pan. Add cauliflower and sauté briefly.